Thanks to all of the celebrities and mommy bloggers out there, many new moms feel plenty of pressure to make organic baby food from scratch. Some feel guilty if they don't make all of their own baby food, as if they aren't giving their child the best start possible. But when time and sleep are limited, what's a loving parent to do? (Photo credit: Brian Brodeur via Flickr). 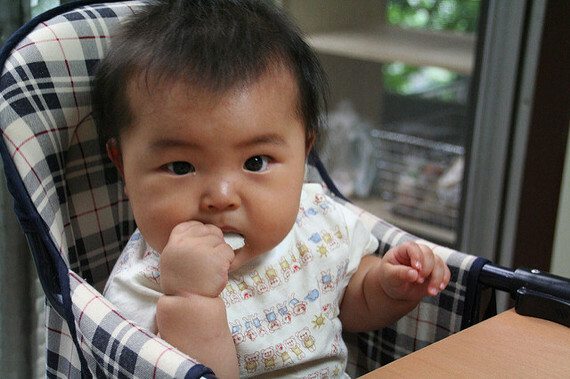 Choosing which foods to feed your baby can be anxiety-provoking for new parents. In the age where we worry about synthetic pesticides, GMOs and more, parents can feel plenty of pressure to make the right choice. Common worries include wondering whether your baby is getting enough nutrients and concerns over using baby food made with too much sugar, salt or preservatives. Plenty of new parents also feel pressure to make all of their baby's food from scratch, despite competing demands on their time and energy. So why all the recent pressure about choosing the right foods? Our parents fed us as well as they knew how and we all turned out great, right? Researchers have found that what's eaten in the first three years of age shapes people's food preferences for the rest of their lives. 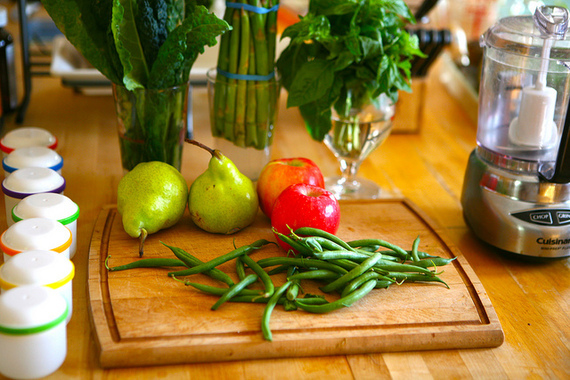 Ensuring healthy, nourishing foods are on the menu is one of the best ways parents can help their kids be healthy adults. (Photo credit: Yoshihide Nomura via Flickr). 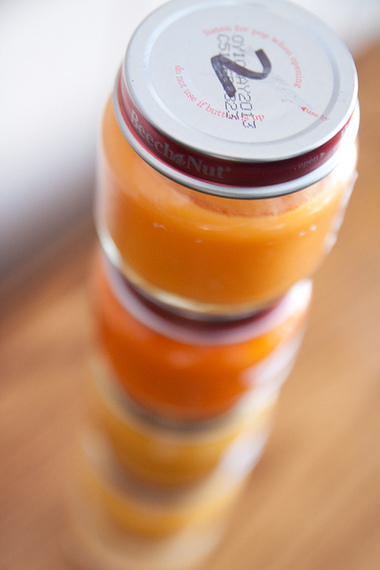 Recently, obesity experts have raised concerns about the salt and sugar content of prepared baby food. Consuming foods that are too salty and sweet could lead children to prefer these flavours that happen to be found in junk food, increasing the risk of obesity. 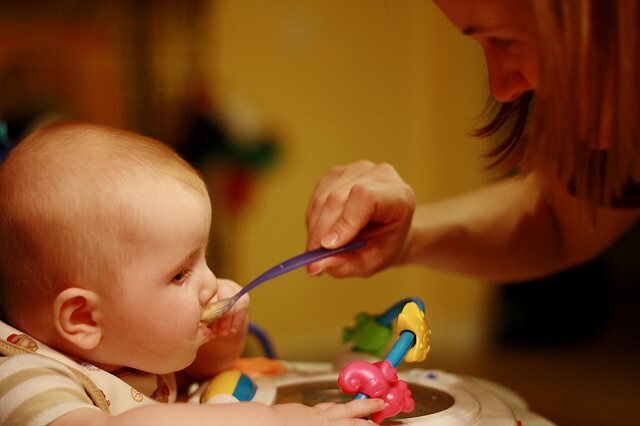 Studies of the nutritional value of baby food have found some brands are also low in nutrients. Not to worry, there are wonderful organic baby food companies that feature wholesome ingredients. Canadian company Love Child Organics has everything from first foods like pureed fruits and vegetables to Savoury Baby Meals that are vegetarian, gluten-free and feature the goodness of superfoods such as quinoa, lentils, chickpeas, kale and more. Flavours like Pumpkin Risotto with Spinach and Chickpeas will turn your baby's taste buds on to healthy foods rather than sugar, salt and preservatives. Thanks to all of the celebrities and mommy bloggers out there, many new moms feel plenty of pressure to make organic baby food from scratch. Some feel guilty if they don't make all of their own baby food, as if they aren't giving their child the best start possible. But when time and sleep are limited, what's a loving parent to do? (Photo credit: The Dabblist via Flickr). Mom of two Amanda Chai relied on a mix of both homemade and store-bought baby food. Amanda says, "I made some baby food and would freeze it in small portions mostly because it was cheaper and I could ensure organic food was used -- but it was time-consuming. We always had a handful of pouches of store-bought baby food in the cupboard which I would take in my backpack to feed the kids when we were out and about. I would choose ones that contained organic fruit and veggies and a source of protein or starch. I also avoided the ones with weird additives." New mom Julia Partington feeds her daughter easy to prepare foods like mashed sweet potato, avocado and banana and supplements these with store-bought baby food. "I did feel a lot of pressure to make baby food, and I did for a while but life is so busy right now that sometimes it's just easier to buy it. I was so relieved to see that there are great organic baby food brands available now." As Julia puts it, "I guess what I want to say to other moms out there is that it's okay to buy store-bought baby food. A lot of this food is pure, simple, nothing added and healthy for babies. Plus, if you get meat, you don't have to worry about over or under cooking it. That is one thing I worried about a lot!" Choose organic baby food where possible to minimize your baby's exposure to synthetic pesticides. Look at the ingredient list and make sure the first few ingredients match the name and picture on the front of the food. For example, if it's called Kale and Black Bean Chili, those foods should show up early in the ingredient list. Limit the sugar in your baby's food to help him or her avoid developing too much of a sweet tooth later on. 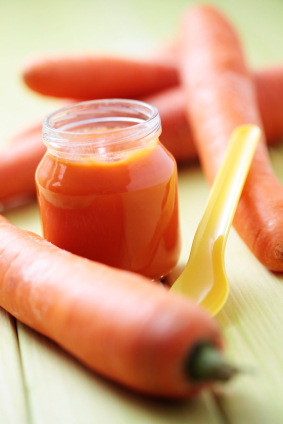 Even if it's natural sugar, some baby food can have 20 grams of sugar or more. Compare the grams of sugar in the Nutrition Facts Tables between brands to find the option that's lowest in sugar. Make sure you check the portion size, as some companies list a serving as being only half of a pouch. Check that ingredient list for added gums and starches used to bulk them up. Whole foods like quinoa and squash are great, but too much corn starch or maltodextrin adds empty calories that aren't the best food for your baby. Babies can't process salt as well as adults can and feeding them salty foods early in life can set them up for craving salty foods as they get older. Choose baby food with no added salt or compare the sodium amounts between brands to get the healthiest option. Keep food safety in mind for your baby's sensitive tummy. Always check the expiration date before using baby food. Put the baby food on a dish rather than feeding from the tube or jar so you can keep any leftovers in the fridge. Any meat or poultry will keep for 1 day. Fruit and vegetables will keep for up to two days. (Photo credit: Steven Depolo via Flickr). Disclosure: Christy collaborated with Love Child Organics in writing this article. All opinions are 100 per cent Christy's own.